NEW YORK (CNN) -- They arrive cloaked in secrecy, often using fictitious names and sometimes donning disguises. 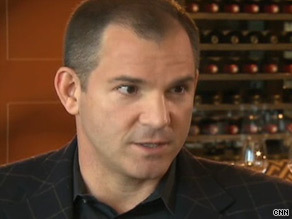 Restaurant critic Frank Bruni says he used credit cards with pseudonyms to try to keep his anonymity. They aren't spies. They're restaurant critics, whose mere presence can make even the calmest chef shake in his or her chef whites. And one critic strikes even more fear than the rest. "The zenith, the pinnacle is the New York Times restaurant critic," says Jimmy Bradley, owner of The Red Cat restaurant in Manhattan's Chelsea section. For the past five years, that position has been held by Frank Bruni, a former political reporter whose witty restaurant reviews garnered him a loyal readership. Restaurant owners do everything in their power to spot a critic in the crowd. And in a cat-and-mouse game, critics try every trick in the book to go unnoticed, so they'll be treated like anyone else. Bradley has been keeping tabs on Bruni, compiling a dossier that describes Bruni's preferences, his aliases, his usual dining companions, even his clothing. "He likes to wear pretty funky sneakers," Bradley shares. For instance, Bruni says he used credit cards with pseudonyms in order to maintain his anonymity. He'd get the cards in unisex names like Pat Reynolds or Robin Parker, so that his dining companions could use them to throw off suspicions by restaurant staff. Unfortunately, he concedes, it didn't always work. "Dining companions are not good covert operations agents," Bruni says. It's one of the many reasons Bruni no longer feels restaurant critics can remain anonymous. "It's impossible for someone to remain anonymous night after night and restaurant after restaurant," he says. It's one of the many challenges that will face new Times critic Sam Sifton. Eatmedaily.com, a food blog, already has pictures of Sifton doctored to show how he'd look in disguises ranging from Donald Trump to Groucho Marx. Waiting for Sifton's arrival in her restaurant is chef Missy Robbins of the new A Voce Columbus in midtown Manhattan. She says she tries to keep her staff calm when a critic visits and relishes the opportunity to put her best foot forward. If that means coming in on her day off or even leaving her own birthday party, she'll do it. "When there is a critic in the house, I can promise you I'll be here in -- as quickly as I can get here." Although it is easier than ever for restaurants to spot critics, former New York Times critic Ruth Reichl hopes the tradition of anonymity will continue. "One of the great things that a great newspaper like the New York Times or the L.A. Times has going for it is that the critics pay their own way. They don't announce that they're coming and they do it in a really honest way," she says. Top critics generally make several visits to a restaurant before writing their review. Reichl was writing for the Los Angeles Times when she accepted the job at the New York Times. On the flight to New York, the woman sitting next to her recognized her and started telling her details about Reichl's personal life. "I said, 'How do you know all of this?' and she said, 'I'm a waitress and there is a huge picture of you in the restaurant I work in with "Reward" written across the bottom, and anybody who spots you gets $500,' " Reichl says. It was then she decided to wear elaborate costumes and take on various personas in order to go unrecognized. She says when she was in disguise she often wasn't treated very well. She wrote a scathing review and believes restaurants learned to treat all customers with respect. "If you're just Joe Schmo, and they don't really care, they very often will humiliate you," she says. "And you know, the thing is, it doesn't matter how good the food is, if you've been made to sit in a restaurant for 45 minutes waiting for your table, they can feed you manna from heaven, and the evening is ruined." Bruni and Reichl agree that the critics have one major advantage: Restaurants can't reinvent the menu just because a critic is in the house. But both also concede remaining anonymous is harder than ever.